The new Volkswagen Golf SportWagen offers drivers from Chicago and beyond a responsive engine, plenty of cargo room, and impressive safety specs. This powerful wagon version of the new Golf is even offered in the all-wheel drive Volkswagen Golf SportWagen 4Motion configuration — the versatility of the hatchback with more space and capabilities. We appreciate your interest in our inventory, and apologize we do not have model details displaying on the website at this time. Please fill the form out below and our team will quickly respond, or, please call us at (708) 469-4248 for more information. 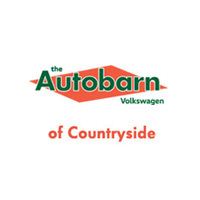 Why Buy the VW Golf SportWagen at The Autobarn Volkswagen of Countryside? In addition, the Golf SportWagen interior can be equipped with a panoramic sunroof or a 400-watt Fender Audio system.The experts at Edmunds were impressed with the Golf SportWagen model’s “impressive seat and ergonomic comfort,” and U.S. News and World Report says it’s “enjoyable to drive, is highly practical, and has a great predicted reliability rating.” Stop by our showroom near Naperville to see the new SportWagen in person and take it out on the open road!